Josephine, heroine of Ed Brubaker’s and Sean Phillips Image Comics series FATALE, has carried the curse for decades - able to enthrall men but chased by an ancient evil, she is seemingly destined to cause the ruination of anyone who loves her. The haunting series was originally planned as a mini-series, but Brubaker and Phillips have found that curse of the femme fatale is inexhaustible. Thanks to strong sales, a wealth of stories yet to be told, and a certain mesmerizing quality, FATALE is now an ongoing series. To launch the new format, Brubaker and Phillips are taking readers back in time with four standalone issues of FATALE. Jo may feel alone in her curse, but these stories will let readers in on her past and show that other women have shared her fate. The first of the FATALE Flashback issues, December’s FATALE #11, will reveal Jo’s early years as a femme fatale. As the story follows her on the run in 1930s California, some of her elusive secrets will come to light. In January, FATALE #12 will take readers all the way back to Medieval Europe, when a woman possessing the powers of the femme fatale curse faces doom not only from demonic forces but also from the scourge of witch-burnings. February brings the femme fatale to the Wild West with FATALE #13, when a man - or a woman - could blaze a trail with a loaded pistol and a steady hand. FATALE #14 in March is a World War II horror adventure, when Jo crosses paths with crazed Nazi cultists behind enemy lines. Each issue of FATALE contains extra articles and art not collected in the trade paperbacks, including essays by renowned pop culture scholar Jess Nevins (The Encyclopedia of Fantastic Victoriana), whose writing also appeared in Brubaker’s and Phillips’ Criminal. 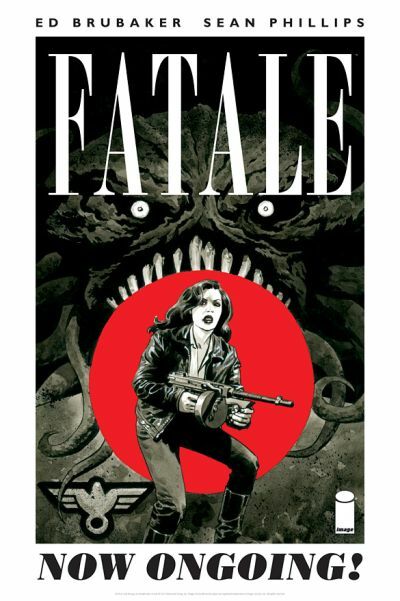 FATALE, written by Brubaker, drawn by Phillips, and with colors by Dave Stewart, was introduced in January 2012, the first new series in an iconic year for Image Comics. Its first five issues have been collected into a trade paperback, FATALE: DEATH CHASES ME, which Publishers Weekly called an “addictive page-turner” in a starred review. The French edition of DEATH CHASES ME has just been announced as one of the nominees for the prestigious AngoulÃªme Award, in the Polar (Mystery) category. Its second trade paperback, THE DEVIL’S BUSINESS, is available for pre-order now and will be in stores on January 2, 2013.